This concludes our little journey into constructivism, complex system thinking, and the big question: "What do we really really really know?" Not really a summary of two article, but rather a summary of two constructivists‘ concepts. 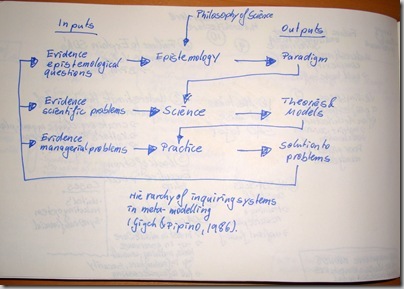 Eriksson, Darek: A Principal Exposition of Jean-Louis Le Moignes Systemic Theory; in: „Cybernetics and Human Knowing“. Vol. 4 (1997), No. 2-3. 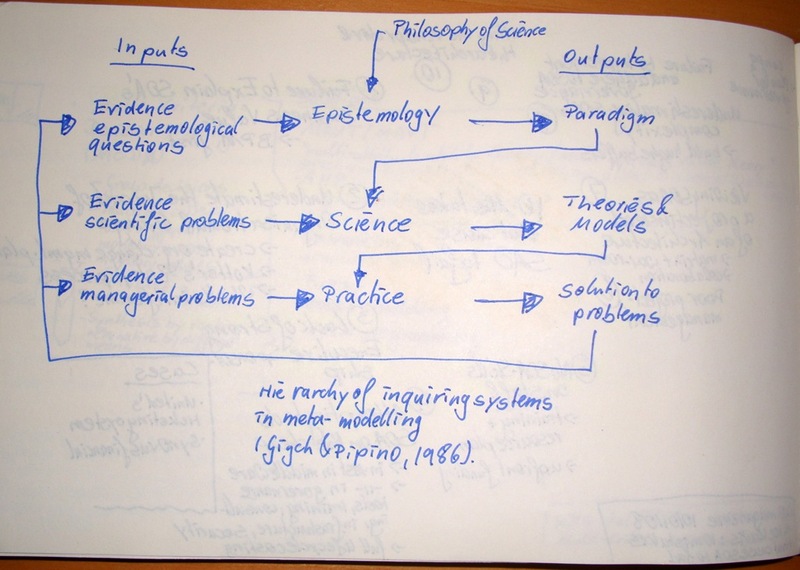 When thinking about complexity and systems one sooner or later comes across Le Moigne. 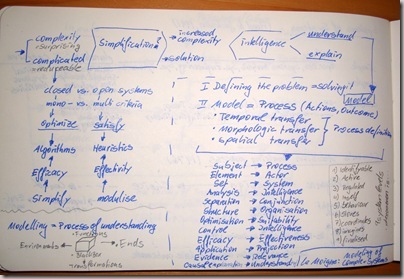 Departing point is the dilemma of simplification vs. intelligence. Therefore systems have to be distinguished to be either complicated = that is they are reducible, or to be complex = show surprising behaviour. This distinction follows the same lines as closed vs. open systems, and mono- vs. multi-criteria optimisation. 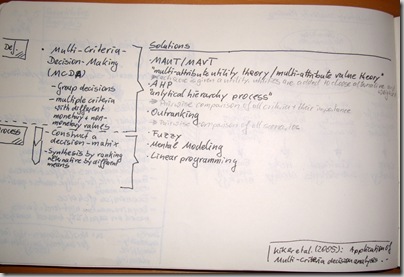 Closed/mono-criteria/complicated systems can be optimised using algorithms, simplifying the system, and evaluating the solution by its efficacy. 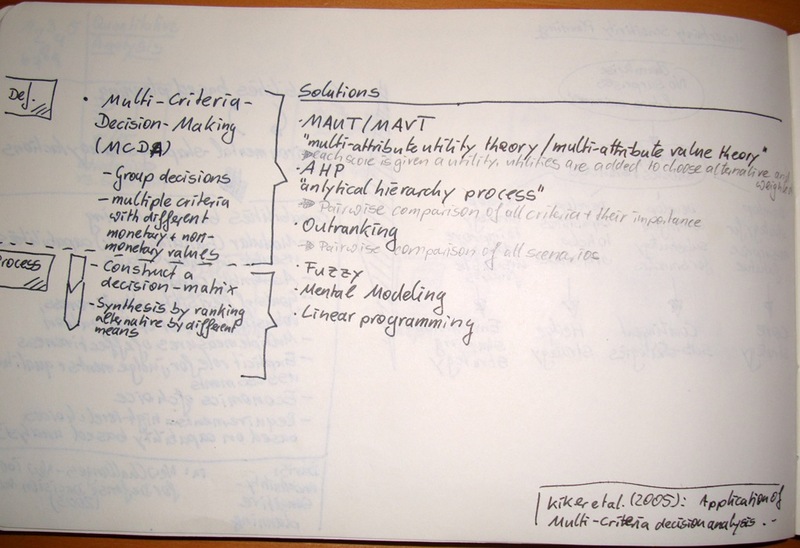 On the other hand, open/multi-criteria/complex systems can only be satisfied by using heuristics, breaking down the system into modules, and evaluating the solution by its effectivity. 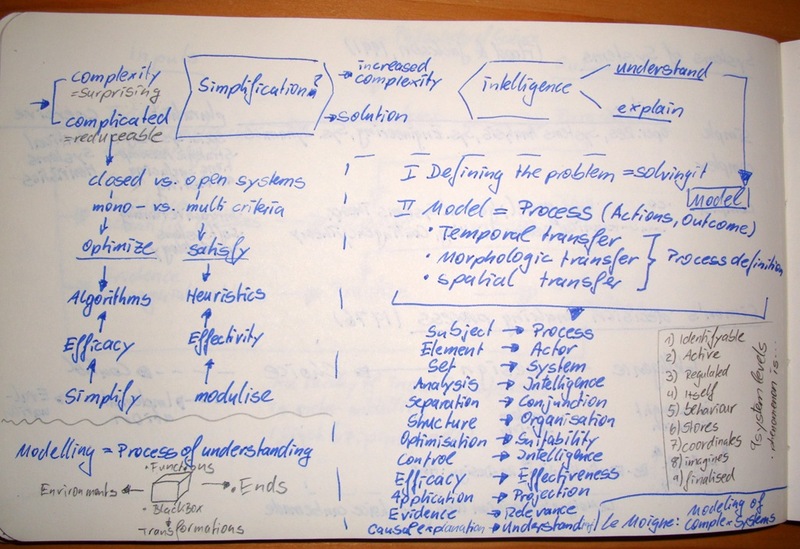 In the case of complex systems simplification only increases the complexity of the problem and will not yield a solution to the problem. Instead of simplification intelligence is needed to understand and explain the system, in other words it needs to be modelled. As Einstein already put it – defining the problem is solving it. I stumbled upon this book somewhere in the tubes. I do admit that I felt appealed to combine a fictional narrative with some scientific subtext. Unfortunately for this book I put the bar to pass at Tom DeMarco’s Deadline. On the one hand Singh delivers, what seems to be his own lecture on decision-making as the alter-ego of Professor Armstrong; on the other hand the fictional two-level story of Larry the first person story-teller and the crime mystery around Laura’s suicide turn murder does not really deliver. Let alone the superficial references to Chicago, which I rather found off putting, I think a bit more of research and getting off the beaten track could have done much good here. Lastly, I don’t fancy much the narrative framework driven style so commonly found in American self-help books – and so brilliantly mocked in Little Miss Sunshine. 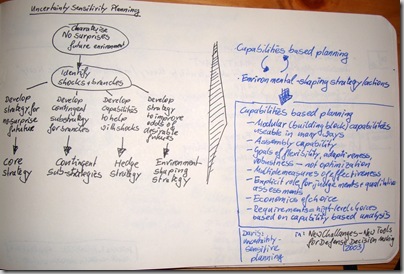 Three methods for decision-making are presented in the book – (1) balance sheet methods with applied weighting, (2) WARS = weighting attributes and scores, and (3) scenario strategies. Lastly, Singh reminded me again of the old motto „Non Sequitur!“ – making me aware of all the logic fallacies that occur if something sounds reasonable but ‚does not really follow‘. 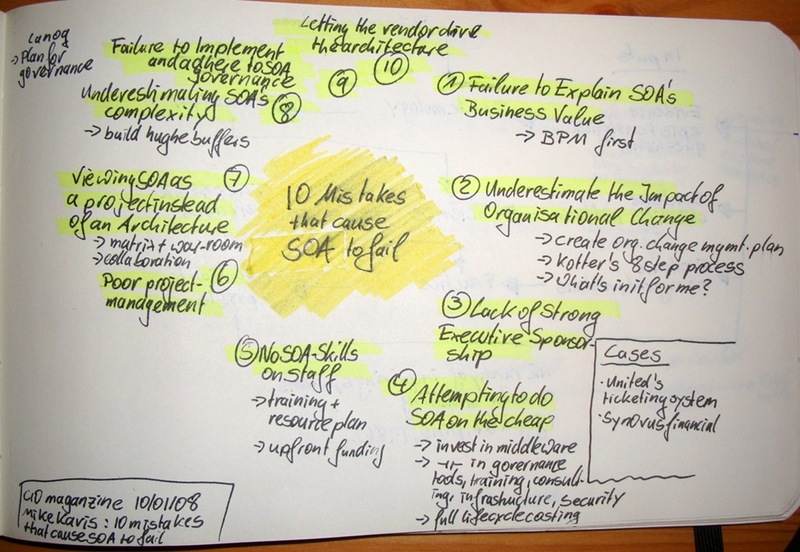 Kavis, Mike: 10 Mistakes that Cause SOA to Fail; in: CIO Magazine, 01. October 2008. I usually don’t care much about these industry journals. But since they arrive for free in my mail every other week, I could help but noticing this article, which gave a brief overview of two SOA cases – United’s new ticketing system and Synovus financial banking system replacement. Sorry everyone, on this wonderful Thanksgiving day this Blog has been flooded with Spam in the comments section. I don’t know why it should be that Thanksgiving increases the need for medication for back pains, restless leg syndrom, or the old-time classic e.d. Klakegg, Ole Jonny; Williams, Terry; Magnussen, Ole Morten; Glasspool, Helene: Governance Frameworks for Public Project Development and Estimation; in: Project Management Journal, Vol. 39 (2008), Supplement, pp. S27S42. Their analysis starts with the question of „Who are governance relevant stakeholders?„. The authors show two different general approaches to public governance stakeholders – Shareholder Value Systems and Communitarian Systems. The Shareholder Value System is based on the principle that only shareholders are legitimate stakeholders – a system which is used in the US, UK, and Canada. On the other hand the Communitarian System is based on the idea that all impacted communities and persons are relevant stakeholders – a system typically found in Norway, Germany, and numerous other countries. A secondary line of thought is the difference between Western and Asian stakeholder ideas, whereas the Asian idea is underlining the concept of family and the Western idea is underlining the relationship concept. To pin down the idea of public project governance the authors draw parallels to corporate governance with it’s chain of management ↔ board ↔ shareholder ↔ stakeholder. The APM defines project governance as the corporate governance that is related to projects with the aim that sustainable alternatives are choosen and delivered efficiently. Thus the authors define a governance framework as an organised structure, authoritive in organisation with processes and rules established to ensure the project meets its purpose. The reviewed governance frameworks show interesting differences – for example in the control basis, reviewer roles, report formats, supporting organisation, and mode of initiation. The principles they are based on range from management of expectations, to establishing hurdles to cross, to making recommendations. Focus of the reviews can be the business case, outputs, inputs, or used methods. Maylor, Harvey; Vidgen, Richard; Carver, Stephen: Managerial complexity in project-based operations – A grounded model and its implications for practice; in: Journal of Project Management, Vol. 39 (2008), No. S1, pp. S15-S26. Maylor et al. 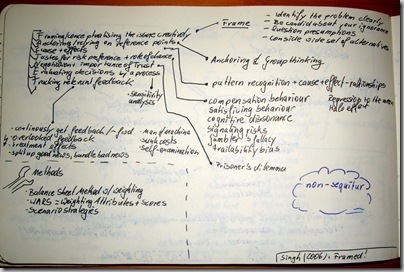 investigate the question – What makes a project complex? More specifically this question asks for managerial complexity of projects, which is neither technical nor environmental complexity which has been looked at in depth in research surrounding the whole areas of function point estimation. This Complexity Measurements Table shows their full set of questions with the questions stricken out that were not mentioned sufficiently in the focus group discussions. Crawford, Lynn; Cooke-Davies, Terry; Hobbs, Brian; Labuschagne, Les; Remington, Kaye, Chen, Ping: Governance and support in the sponsoring of projects and programs; in: Project Management Journal, Vol. 39 (2008), No. S1, p. S43-S55. Sponsoring of projects and programs is increasingly getting attention in project management research. The authors argue that this is due to two factors – (1) recognition of contextual critical success factors and (2) push for corporate governance. 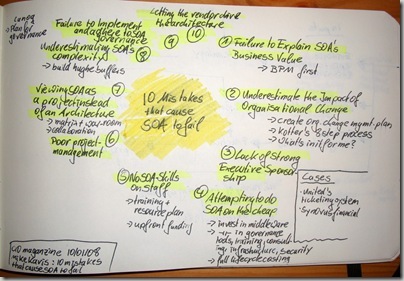 Their general model consists of two dimensions – Need for Governance and Need for Support. In this model each sponsor can find his/her spot in the matrix by assessing what his/her focus of representation is. Sponsors either represent the need of the permanent organisation (need for governance) or they represent the need of the temporary organisation (need for support). In the interviews conducted, they identified typical situations which require a shift in emphasising one or the other dimension. Among the resons and examples given during the interviews were: the project is high risk for the parent organisation, project performs poorly, markets are changing rapidly, governance or regulation call for increased oversight, project team behaved illegaly or non-compliant, the project is mission-critical, or the project’s objective is to re-align the company to a new strategy. Typical situations given were: parent organisation fails to provide resources, project faces resistance in the organisation, different stakeholders impose conflicting objecitve on the project, lack of decision-making by the parent organisation, project team is weak or inexperienced, or the project shows early signs of difficulities. What are the essential attributes to effective sponsoring? Which influence does one or the other strategie has on project success? Which competencies are required in a sponsor? What are the factors contributing to effective sponsorship performance? What does the role of the sponsor in different contexts of programmes/projects/organisations look like? Schleicher, Deidra J.; McConnell, Allen R.: The Complexity of SelfComplexity: An Associated Systems Theory Approach; in: Social Cognition, Vol. 23 (2005), No. 5, pp. 387-416. 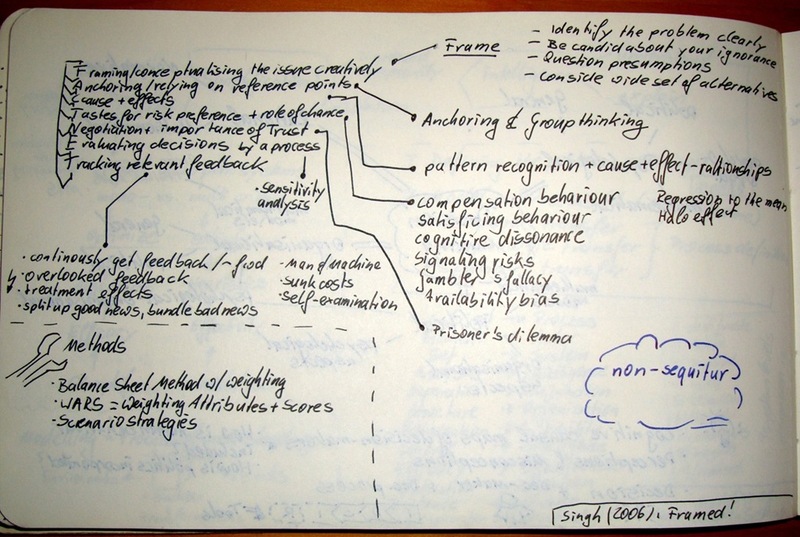 In my search for complexity measurements of intangible projects I came across this approach to measure the most complex thing I could think of – our beautiful mind. In this article Schleicher & McConnell describe the commonly used trait sorting exercise to measure self-complexity. Participants are presented 25-40 traits or roles on cards. Then they are asked to group them so that they best describe the aspects of their selfs. For example a participant might group well-dressed, anxious, mature into as traits describing the student aspect of her self. Studies have confirmed that participants with a higher self-complexity are better in managing stress, well-being, physical illness, and depression. Schleicher & McConnell propose a two dimensional concept of self-complexity – (1) target-reference: concrete vs. abstract, (2) self-reference: public vs. private self. 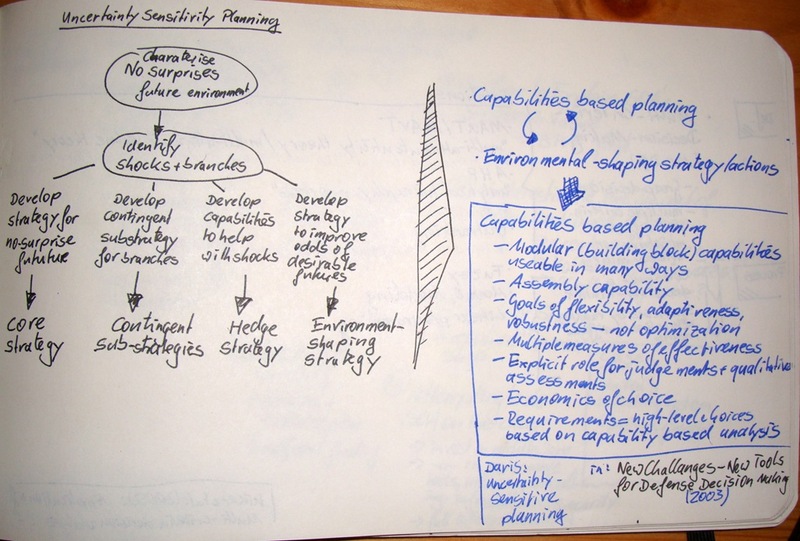 After the monstrous write-up of the Bredillet article on the MAP method, I just wanted to quickly write this down. 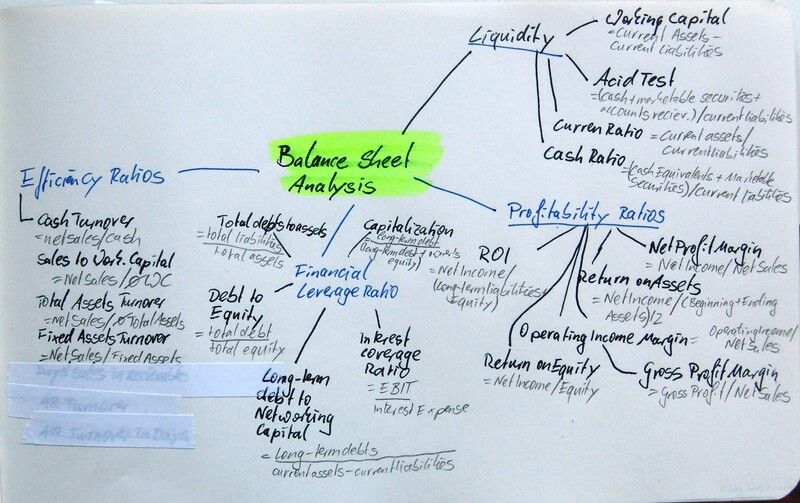 I did a quick overview of the usual suspects when it comes to Balance Sheet Analysis. There are four major categories I) Liquidity, II) Profitability Ratios, III) Financial Leverage Ratio, IV) Efficiency Ratio. Blichfeldt, Bodil Stilling; Eskerod, Pernille: Project portfolio management  Theres more to it than what management enacts; in: International Journal of Project Management, Vol. 26 (2008), No. 4, pp. 357-365. These activities are free of any value. Blichfeldt & Eskerodt analyse the reality of project portfolio management to find out if it does any good to the organisations it is used in. In reality they find that project portfolio management is merely a battle for resources and that portfolios consist of way to many projects to be practically manageable. He finds two distinct categories of projects in a portfolio – (1) enacted projects and (2) hidden projects. Among the enacted projects are typically the new product developments, the classic project, trimmed for successful launch of a new cash cow. But in this enacted project category there are also the larger renewal projects. The larger renewal projects are usually not directly linked to the demand side, their primary aim is to enhance internal activities and not customer value, and some of them cut across departments. Overall the large renewal projects are not as well managed as product development projects – they lack experience, have a low priority, and lack structure, reviews etc. The second category are the hidden projects. Usually bottom-up initiatives, departments or even single persons start during their work hours, or in specifically allocated time to pursue innovative projects of own interest. Blichfeldt & Eskerod recommend to enact more projects. Manage the larger renewal projects in a more structured way, and include the hidden projects into the portfolio. If they drain resources they must be managed. Without destroying the creativity and innovation that usually come from these grass-root projects, organisations should allocate resources to a pool of loosely-controlled resources. Unenacted projects should be allowed to draw resources from this pool, with minimal administrative burden. Whitty, S. J.; Schulz, M. F.: The PM_BOK Code; in: The Proceedings of 20th IPMA World Congress on Project Management, Vol. 1 (2008) , pp. 466 – 472. The bold claim of this article is that project management is more about appearance than productivity. Whitty & Schulz argue that our hard-wiring for memes and the western culture have turned project management (in it’s special representation in the PMI’s PMBOK) into a travesty. The western culture is synonymous with the spirit of capitalism combined with the meme of the corporation, which has been disected many times most noteably by Achbar, Abbott & Bakan. 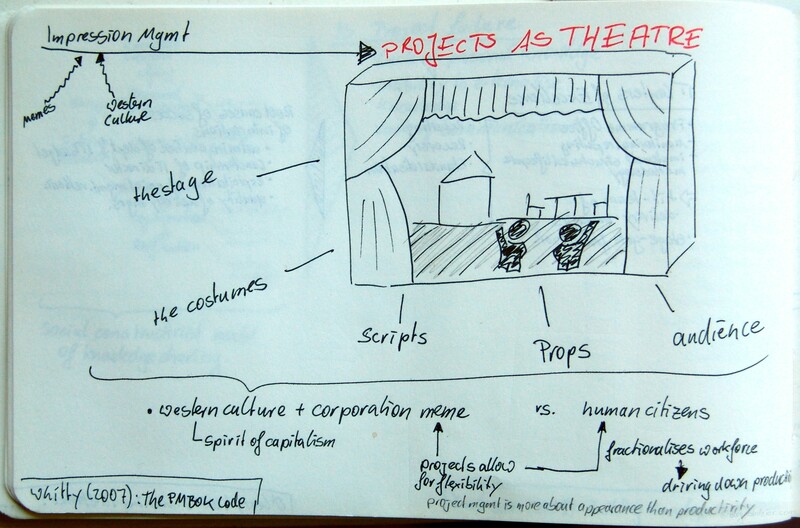 The authors compare the everyday madness of projects to nothing else but theatres. Keeping up appearances. They draw similarities between the theatrical stage – think meeting rooms and offices, costumes – think dark suits or funny t-shirts, scripts – think charts and status reports, props – think powerpoint, and audience – think co-workers and managers. Whitty & Schulz that the big show we put up everyday is to appear in control and successful. Project management is the ideal way to represent western culture. Being flexible, ready for change, constantly exploiting new opportunities. 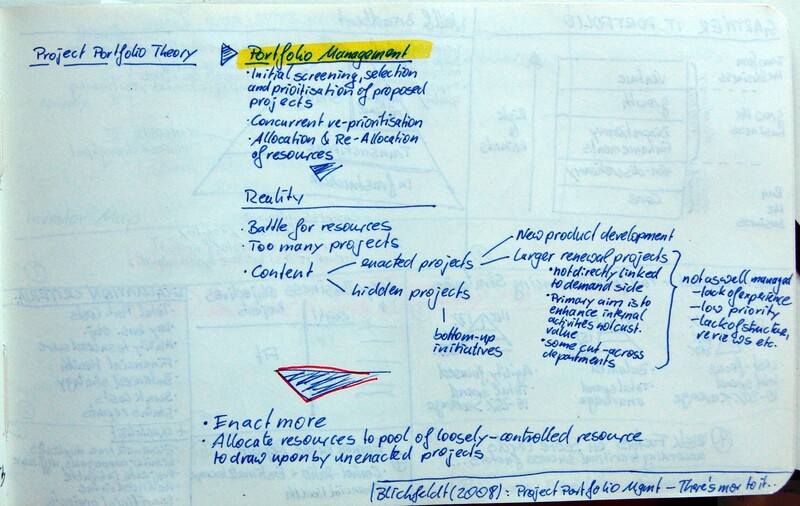 On the flip side, the authors argue, that project management kills creativity and democracy. It fractionalises the workforce, thus driving down productivity. The way out of this predicament is to „reform […] the PMBOK® Guide version of PM in a way that elieves practitioners from performativity, and opens project work up to more creative and democratic processes“ (p. 471). O’Leary, Tim; Williams, Terry: Making a difference? Evaluating an innovative approach to the project management Centre of Excellence in a UK government department; in: International Journal of Project Management, Vol. 26 (2008), No. 5, pp. 556-565. The UK has rolled out the ambitious programme of setting-up IT Centres of Excellence in all its departments. 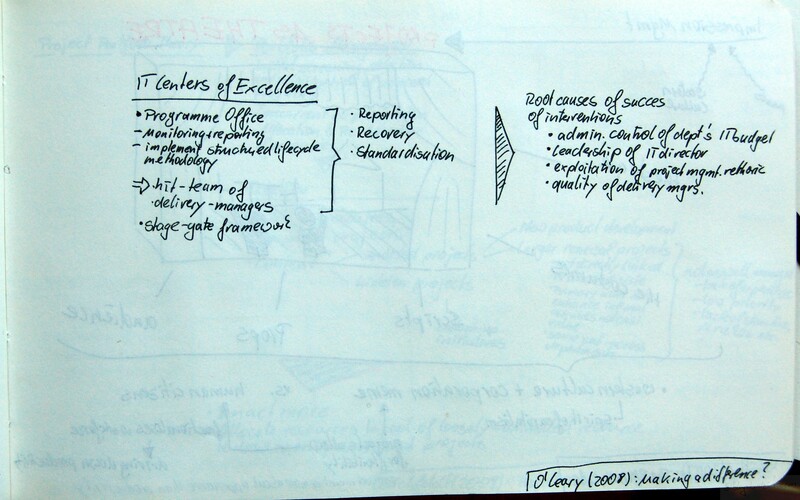 Focal point of these Centres of Excellence are Programme Offices. The role of these Programme Offices has been defined as: Reporting, Recovering & Standardising. The objectives for the programme offices are monitoring and reporting the status of the IT initiatives in the department, and implementing a structured life cycle methodology. This methodology ties in with a stage-gate framework that needs to be introduced. Additionally hit-teams of delivery managers have been set-up to turn-around ailing projects. Jackson, Paul; Klobas, Jane: Building knowledge in projects – A practical application of social constructivism to information systems development; in: International Journal of Project Management, Vol. 26 (2008), No. 4, pp. 329-337. This cylcle includes the facilitating steps of Objectivation (=creating organisational knowledge), Legitimation (=authorising knowledge), and reification (=hardening knowledge) between externalisation and internalisation. 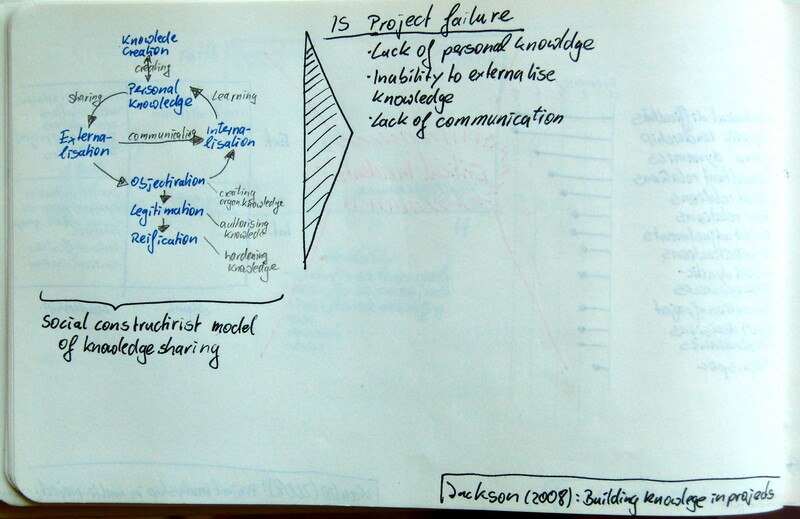 Jackson & Klobas argue that IT project failure can be explained using this model. The authors outline and discuss three failure factors – (1) lack of personal knowledge, (2) inability to externalise knowledge, and (3) lack of communication.